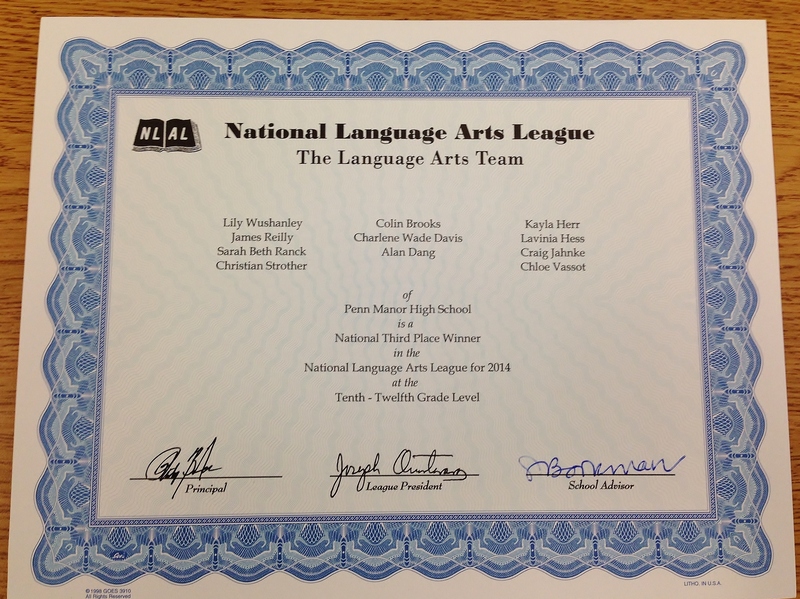 Congratulations to Penn Manor High School students for earning a third-place finish in the 2014 National Language Arts League Contest. A team of students in grades 10 through 12 scored 443 points out of a possible 500 on the multiple-choice test of spelling, vocabulary, reading comprehension, analogies and grammar. The total score was the third highest in the nation among upperclass students who took the test, which was administered in the spring. 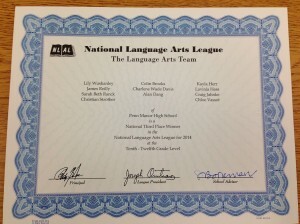 The top-scoring Penn Manor students were Lily Wushanley, James Reilly, Sarah Beth Ranck, Christian Strother, Colin Brooks, Charlene Wade Davis, Alan Dang, Kayla Herr, Lavinia Hess, Craig Jahnke and Chloe Vassot.